Yellowstone National Park is one of the most magical destinations to visit with kids of all ages. For those visiting with teens, it’s helpful to know what they will want to see or skip. 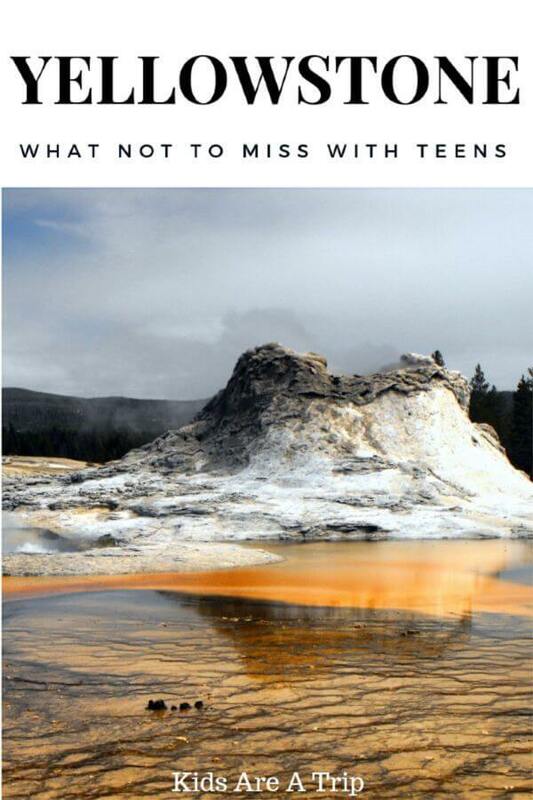 Teens realize they visiting one of the best national parks in the United States, but parents will enjoy the fact teens will be spending time in nature, unplugged. 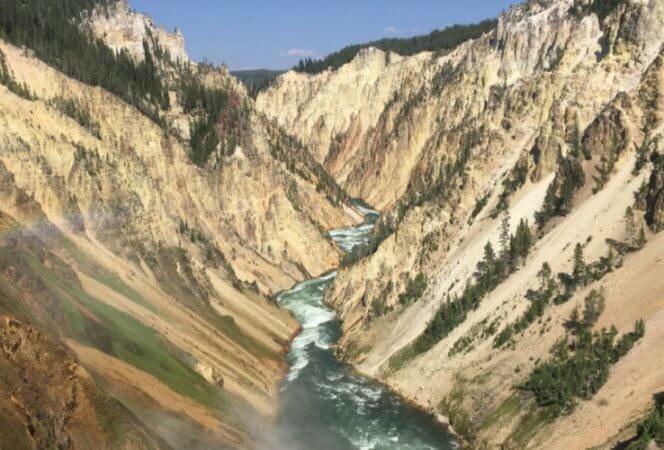 We’ve asked our teen writing team of Corey and Skylor to share their favorite experiences in Yellowstone National Park and what they would recommend for others. The Old Faithful Geyser at Yellowstone National Park is a huge natural geyser that shoots water up to 180 ft in the air. The geyser erupts every 35 to 120 minutes and is a spectacular sight to see. 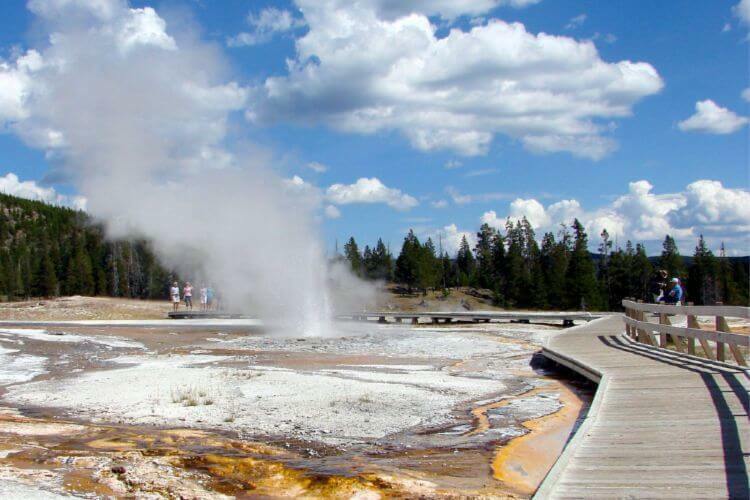 Each eruption lasts from about 1 ½ to 5 minutes and it is one of the largest geysers in Yellowstone. When my family and I first arrived there, an eruption was in progress and we saw the geyser shoot up boiling water high into the air. The Old Faithful Geyser is a must for all visitors to the park. The Elephant Back Mountain Trail is a four mile trail that leads up a huge mountain in Yellowstone. 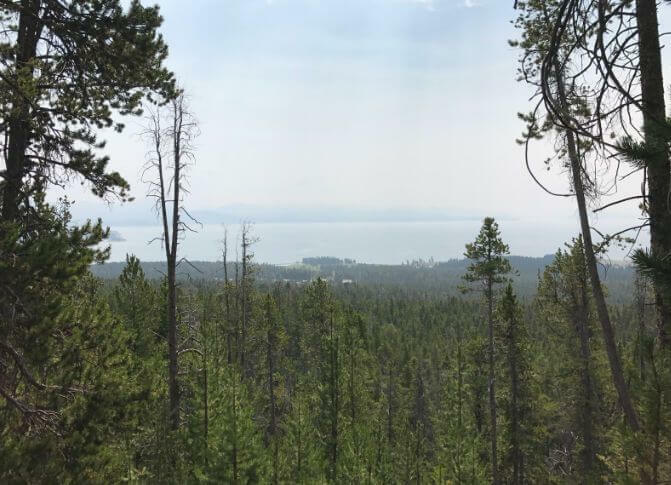 There are a lot of trees and the path up is a little challenging, but the view from the top makes the long hike worth it. 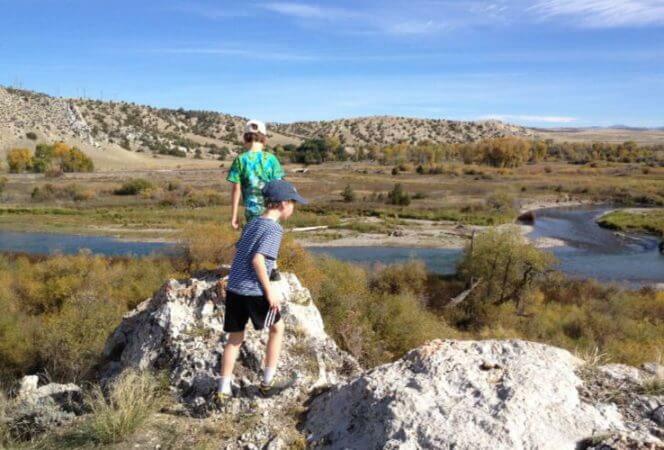 While my family and I were climbing, we saw plenty of wildlife and amazing views. When we reached the top, we saw a huge outstretched landscape filled with beautiful mountains and long flowing rivers. On our way down the trail it started to hail and my family had to quickly run back down! Although the hike up was very tiring it gave me a chance to see lots of animals and the beautiful sights of Yellowstone. The wildlife in Hayden Valley is amazing. You can witness wildlife all around if you know where to look. A group of people pulled over on the side of the road pointing and shouting or frozen traffic are good indicators that wildlife is nearby. 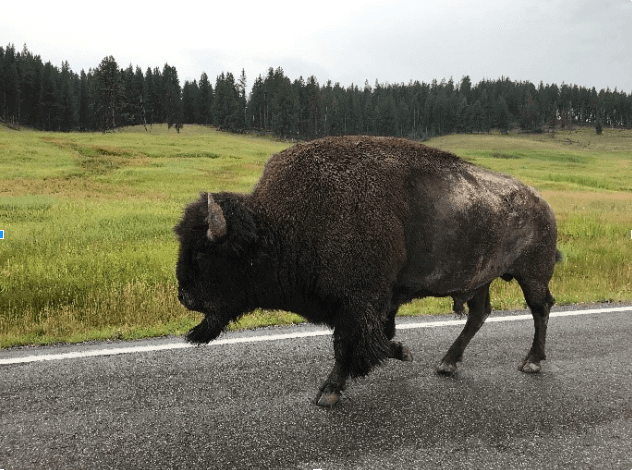 The most frequent animal we witnessed were bison in Hayden Valley. Herds of bison covered hills and were scattered across open plains. Although the enormous size of bison is mesmerizing, don’t get too close to one. Trust me. We had pulled over to snap a quick picture of the bison and before we knew it the bison was chasing us back to our car. In addition, we saw a black bear. A local guide pointed the bear out from her telescope. Although the black bear was just a fuzzy black dot in the telescope, it was my first time seeing a bear so the experience was cool. Hayden Valley is the perfect place to soak up the beautiful scenery and the wildlife of Yellowstone National Park. Mammoth Hot Springs makes you feel like you are in Antarctica. It looks like fluffy snow frozen in sheets of ice. Mammoth Hot Springs look this way because as the hot water rises through the limestone, large amounts of rock are dissolved and a white chalky mineral is deposited to the surface. Although the Hot Springs might look fun to climb on, they are way too hot. The boardwalk provides a safe observing spot to take pictures. 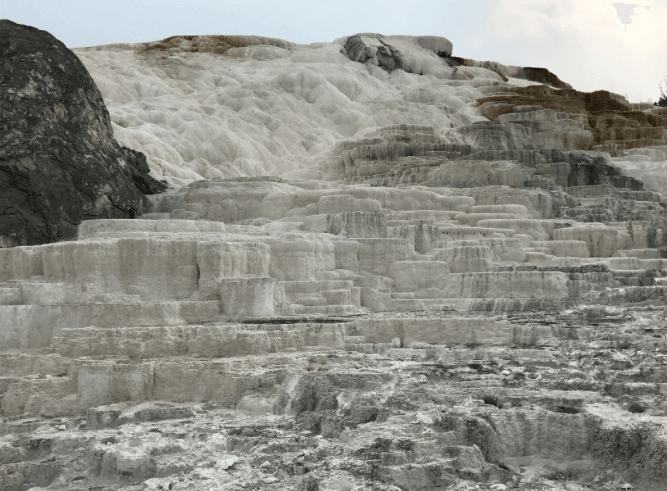 The boardwalk takes you on a trail to all of the Mammoth Hot Springs. However, I have to admit, even though Mammoth Hot Springs is gorgeous, all of the Hot Springs looked more or less the same. I found myself bored very quickly walking on the boardwalk, which is quite long. I didn’t find Mammoth Hot Springs as interesting as the wildlife. The Norris Geyser Basin was an adventure to remember. We walked along a boardwalk trail from which we witnessed geysers and springs. The ground looks as if it is letting out a deep breath via geysers and the springs are all pretty shades of blue. The springs look like a portal to another dimension. After the boardwalk trail, we pulled up randomly to a small square with grass. The whole place was filled with elk! It looked like an elk village! They were huge. People were out of their cars and taking pictures with them. We took tons of pictures with our new friends. All the elks were calm and seemed unbothered by people. Their only concern seemed to be eating the luscious green grass. The Norris Geyser Basin is a must see in Yellowstone National Park. 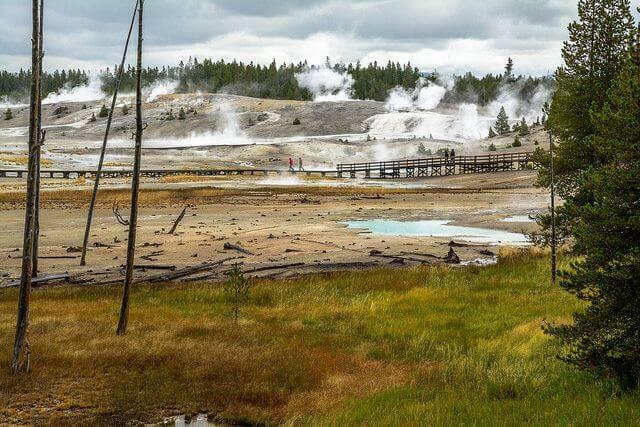 If you’re looking for other Yellowstone information, don’t miss our post 5 Family Friendly Things to Do in Yellowstone.